Conservationists are using star-gazing technology to monitor Borneo's critically endangered orangutans. A drone fitted with a thermal-imaging camera, more commonly used to study the luminosity of stars, is tracking the population. According to the International Union for Conservation of Nature (IUCN), numbers of Bornean orangutans have dropped by nearly two-thirds since the early 1970s, as plantation agriculture destroyed and fragmented their forest habitat. Traditionally, orangutan numbers are estimated by counting nests – which they build in trees for sleeping – from the ground. Those involved with the project say drones can cover large areas more quickly and the thermal cameras help detect hard-to-spot animals. "When we started this, I was sceptical whether this would work. The tropics are a very humid area, it's very hot," said Professor Serge Wich from Liverpool John Moores University, which has collaborated on the project with the World Wide Fund for Nature (WWF) and the HUTAN conservation project. "So, we weren't sure if the heat signal of an orangutan in a nest would be visible on the drone images, but fortunately they are." Researchers conducted 28 flights from two sites over the course of six days and spotted 41 orangutans from the air. 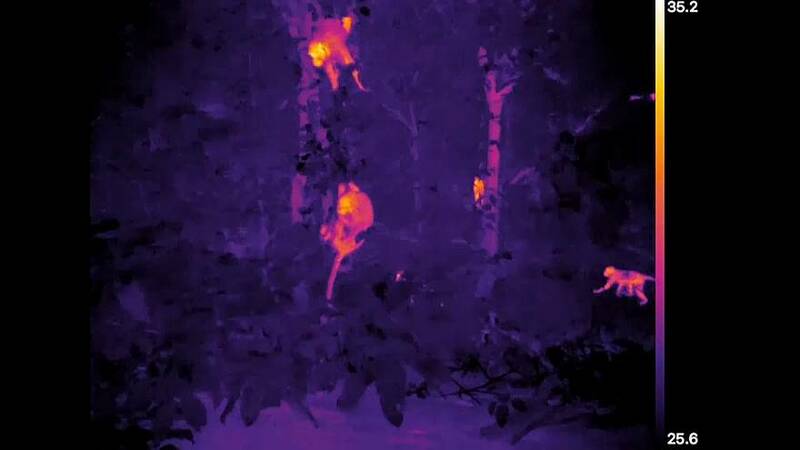 They also spotted a troop of proboscis monkeys but were able to distinguish them from orangutans due to their smaller size. Professor Wich said they predominantly worked in the dark, as forest temperatures during the day are similar to the body temperature of mammals. "During the evening, the forest cools down, and the heat difference becomes larger, so detection goes up," he explained. "In the morning is best, because the forest had had all night to cool down, lose its heat, and then the animals really stand out and you can detect them very, very well." The IUCN, which declared Borneo's orangutans critically endangered in 2016, says land clearing and poaching have left tens of thousands of wild orangutans dead, while the UN estimates that over the past 20 years more than 3.5 million hectares of forest have been destroyed to make way for palm oil plantations.